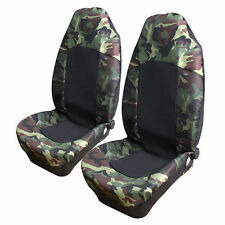 Pilot Automotive Canvas Camo Seat Covers. Pilot Seat Covers add a unique look to your seats. High back seat cover are made to fit specifically high back car seat. It increases the value of your vehicle by protecting your seats from fading, wear and tear. A67 Toyota Tacoma 60/40 Split Bench Camo Camouflage Exact Custom Fit Seat Cover. RealSeatCovers are an exact fit seat covers crafted to fit your make, model and year of vehicle to exact specifications including seat belt cutouts, gear shifts, armrest opening and head rests. This highly evolved camo pattern by Mossy Oak will demonstrate your passion for both the freeAND the cutting edge as you tackle the chaos of the interstate. 600D polyester fabric and 300d accents are abrasion and water resistant, while foam backing holds the camo seat cover in place. "Aries Seat Protector --. ARIES SEAT DEFENDERS. Condition : New. Under NO circumstances will our liability exceed the amount of the original sale. General Warranty Limitations (Applies to all Product Warranties). These covers are made from durable fabrics that are specifically designed to protect your original factory seat covers from excessive wear caused by children, dogs, (pets) and from other heavy duty uses. Trending at $29.42eBay determines this price through a machine learned model of the product's sale prices within the last 90 days. Aries 3142-20 Camouflage Waterproof Seat Defender for Bucket Seat:23.5" x 58.25"
60 Day Returns. Fast Shipping. Authorized Aries Dealer. This highly evolved camo pattern by Realtree will demonstrate your passion for both the freeAND the cutting edge as you tackle the chaos of the interstate. Built-In Access demonstrates this front seat cover's thoughtful design. Contact Us Free Shipping 100% Satisfaction Guaranteed Product Images Mossy Oak 2-Tone Break-Up Available Colors Request Color Samples 2-Tone Mossy Oak Break-Up 2-Tone Mossy Oak Break-Up Infinity 2-Tone Mossy Oak Treestand 2-Tone Mossy Oak Obsession 2-Tone Mossy Oak Duck Blind 2-Tone Mossy Oak Bottomland 2-Tone Mossy Oak Shadow Grass Blades 2-Tone Mossy Oak Brush Solid Mossy Oak Break-Up Solid Mossy Oak Break-Up Infinity Solid Mossy Oak Treestand Solid Mossy Oak Obsession Solid Mossy Oak Duck Blind Solid Mossy Oak Bottomland Solid Mossy Oak Shadow Grass Blades Solid Mossy Oak Brush Coverking Custom Seat Covers normally ship within 10-15 business days. Please allow an additional 1-5 days for UPS or FedEx to deliver your order. Coverking . They where made if a 2014 Ecoline 3500 ford van. camo seat covers with arm rest covers. We list a great deal of estate pieces and unless specified otherwise, they are always as is. Up for sale here is "1-Lot of 2 / King's Woodland Shadow CAMO Universal Bucket Seat Covers". Universal bucket, fits seats with built-in or adjustable headrests. These can be used in Trucks, SUV's and most standard bucket seats, including GM and Ford seats with built in seatbelts. We are proud to be a full-line authorized distributor for all king’s Camo Products. · This fine quality seat cover fits most truck benches including GM, Chevy, Toyota, Nissan, Dodge and Ford seats with built in seatbelts. High back seat cover are made to fit specifically high back car seat. Universal design to fit most vehicles. These seat covers add a unique look to your seats. 100% Washable. Easy slip on installation. Realtree Edge Camo. Take life by the wheel with this camo seat cover. 600D polyester fabric is abrasion and water-resistant, while foam backing holds the camo seat cover in place. Double-stitched seams ensure long-lasting durability. Hatchie Bottom Neoprene (90% 10% Nylon) Max 4 HD Camo Bucket Seat Cover Set (1 piece). These look like they are for a smaller size pickup front bucket seat. Seat Bottom width 46". Seat Bottom depth 21¼". Contact Us Free Shipping 100% Satisfaction Guaranteed Product Images Real Tree Max-5 Available Colors Request Color Samples 2-Tone Realtree Max-5 2-Tone Realtree Advantage Timber 2-Tone Realtree AP 2-Tone Realtree Hardwoods 2-Tone Realtree Xtra 2-Tone Realtree AP Pink Solid Realtree Max-5 Solid Realtree Advantage Timber Solid Realtree AP Solid Realtree Hardwoods Solid Realtree Xtra Solid Realtree AP Pink Coverking Custom Seat Covers normally ship within 10-15 business days. Please allow an additional 1-5 days for UPS or FedEx to deliver your order. Coverking Custom Seat Covers Neosupreme Front Row - Solid Realtree Camo Product Details Coverage: Front Row Seats Material: Neosupreme Warranty: 2 Year Warranty Shipping: Free Shipping. Protect your seats from life's abuses with Covercraft SeatSaver seat protectors. You can travel in comfort without worry of an accident ruining your leather or velour seats because the fabric is breathable and protected with a durable water repellent finish to block most accidents from reaching your seats. Trending at $24.64eBay determines this price through a machine learned model of the product's sale prices within the last 90 days. 60/40 Bench seat style #35 as in Photo. Seat covers do not only protect the original seat but also gives the inside of your car more character. Our seat covers are high quality with 3 layers construction. Contact Us Free Shipping 100% Satisfaction Guaranteed Product Images Brown Front SeatSavers 2nd & 3rd Row SeatSavers also available for certain vehicles Gravel Front SeatSavers Gravel 2nd Row SeatSavers Closed Gravel 2nd Row SeatSavers Opened Two Custom Realtree Camo Patterns also Available. Contact us for more info. Available Colors Request Color Samples Brown Gravel Covercraft Custom SeatSavers Carhartt Duckweave - Front Row - 2 Color Options Product Details Coverage: Front Row Seats Material: Carhartt Duck Weave Warranty: 2 Year Warranty Shipping: Free Shipping to 48 Contiguous States Only. There is an extra charge for HI, AK & International Remarks: This front row of "Custom Fit" and "Made-to-Order" SeatSavers is designed to fit . Fits most bucket seats with or without headrests. Protect, beautify and revitalize your car or truck interior! Spiff up your ride! One-size-fits-most designs are optimized to fit a wide array of Cars, SUVs, Vans and Truck types. 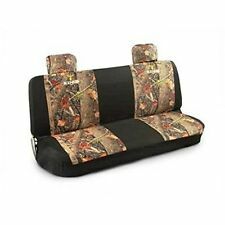 Seat covers Realtree Outfitters Camo/Two-Tone Universal Fit VG Cond! Set of Realtree Outfitters two tone seat covers. Distributed by Signature products Group. These seat covers are made of 100% polyester, so they're sure to last. Designed to fit most cars, SUVs and some trucks. I had them in the old style Ford Escape. Includes two covers for bucket seats, one cover bench back seat and two headrest covers. These seat covers are lightly used but in good condition overall. There are no tears, burn holes, markings, fading, discoloration or other apparent damage. It appears all parts are present and in functional condition. A nice addition to your vehicle, while covering those worn seats. Feel free to ask questions. NEW Browning Signature Neoprene Lowback Seat Cover Mossy Oak BSC4413. Condition is New. Shipped with USPS Priority Mail. Dark Tree Camouflage. Ford F 150 Seat Covers with 40-20-40 Front Seats. 60-40 Rear Seat Cover. Our seat covers are of high quality, with a 3 layer construction. Foam padding that creates comfort, and a backing to give the seat covers its durability. Notes: Includes 2 seat covers, 2 head rest covers and middle console covers. Below, I have written a note describing any imperfections. You may also consult the pics to see the imperfections. I am always willing to negotiate on price and am committed to making this a great buying experience for you! Retention wedge. Our easy install car seat covers make protecting your car seat effortless. SOLID Bench seat with Molded Headrest. Seat covers do not only protect the original seat but also gives the inside of your car more character. Our seat covers are high quality with 3 layers construction. 1 NEW BROWNING Neoprene Lowback Seat Cover. Give your vehicle's bucket seat an outdoorsy look while also protecting it with this Browning pullover, neoprene seat cover. The cover resists water and shields against harsh UV rays. Made of durable, top-quality, canvas-like fabric, Digital Camouflage seat covers are precision crafted and custom tailored to your vehicle's seats for a glove-like fit. The perfect choice for weekend warriors and urban cowboys.